« Do the Monster Mash! When making characters for our Starring You dances, everything but the head is costume designed and made up. Sometimes in our little 425×319 pixel movies, you lose great details that take a lot of time to put together. That brings us to the werewolf from the Monster Mash, who we gave some really cool, but easily missed feet with some super long nails. 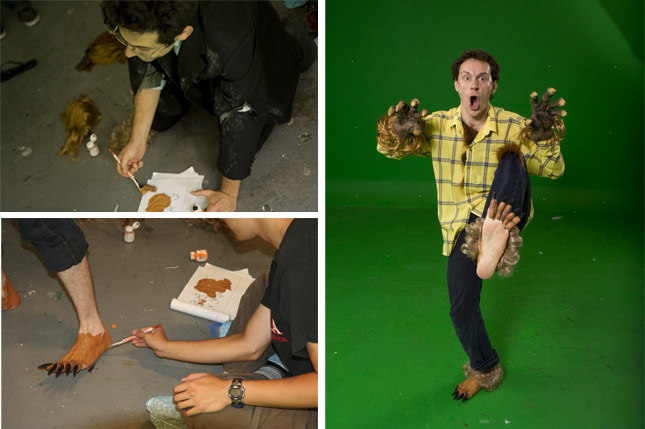 Here Evan mixes the paint up, Alan paints the paint on and Devin wears the wolf toes. This entry was written by paulhanges and posted on October 7, 2009 at 5:41 pm and filed under Inside JibJab, Monster Mash. Bookmark the permalink. Follow any comments here with the RSS feed for this post. Trackbacks are closed, but you can post a comment.